The data has come through from the financial year and it was hot with maximum temperatures the warmest on record from July to June. Minimums were also above average but not record-breaking, at only 0.72 degrees above the long term average. The Bureau of Meteorology's David Jones said it was quite remarkable how consistent the temperature anomalies were. 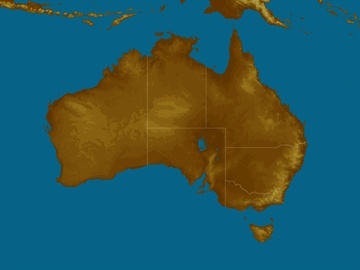 "The only part of Australia that saw temperatures almost average was the far north west corner," he said. 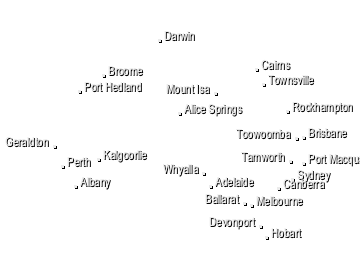 For example, places up and around Wyndham in north-west Western Australia but even there, Dr Jones said it was still pretty hot, just not much hotter than average. "Once you got into the east it was a very warm year," he said. "Not all, but certainly large parts of Queensland, New South Wales, and parts of South Australia saw either record hot conditions or near-record hot conditions for the year." Why such a warm year? Dr Jones said part of the story was the lack of rain. "Many people in eastern Australia know we were in the grip of a drought in many areas and of course, droughts do contribute to above average temperatures, particularly during the day," he said. "But the other story is obviously 'the trend'." You know, 'the trend'. Yes, we are talking about global warming. "Australia is getting warmer so when you have a drought and you've got a trend you set these records," Dr Jones said. What happened to La Nina? But wait. It was a La Nina for a large part of this financial year! La Nina usually means wet and cold conditions for the east coast, doesn't it? It does sometimes, according to Dr Jones. "Firstly we did have a La Nina, but it was a fairly weak La Nina, so its overall influence was pretty modest," he said. "The other thing too was, with the trend going upwards for temperatures, even La Ninas nowadays tend to often be warmer than average." So this year's La Nina didn't have a big enough impact to compensate for 'the trend'. 'The trend' becomes apparent when you look at the data. There is proxy data going back a lot further but even just looking at the last century we can see a lot of the story, according to Dr Jones. "We see that up until about 1950 Australian temperatures went up and down," he said. "Droughts tend to be warmer, wet spells tend to be cooler, but then subsequently in the 1950s, it started to become warmer. "So 'the trend' that we talk about is mainly in temperature and it's been going on now for the best part of 50 to 100 years." Eastern Australia in particular was pretty dry. "I guess one thing that has been a bit unusual about this dry spell, this drought, is it's really come quite close to the coast," Dr Jones said. "Obviously our inland areas do have these cycles of droughts and they can be very harsh." But he said this one is also affected some fairly highly populated, usually quite reliable, rainfall regions. "Areas around Sydney for example [and] the Tablelands through NSW [there were] very dry conditions and] in some spots actually record dry," he said. It wasn't dry everywhere though. The north-west corner of the country had a wet year. The financial year does an excellent job of capturing the northern Australian wet season; for example, 1973-74 and 2010-11, the standout years on the above graph, were the La Nina years of the big Brisbane floods. Is there a cool change in sight? "Basically what we are saying is there's about a 50 per cent chance of an El Nino and that's been reflected in our forecast for dryer than average conditions," he said. "At this point, people are looking for above average rainfall [and] unfortunately, we don't think that's likely." When you look at temperatures, the warm conditions are likely to continue, particularly during the daytime with most of Australia expected to be above average. "No real surprises there but I guess we'd all like to see a little bit more normal coming to our climate," Dr Jones said.